Don and Sally were fifteen minutes late. I wasn’t annoyed by this since I knew they had a long drive to Matlacha from their house, but I found it a little surprising since I knew how eager they were for this trip. We were going after tarpon and the conditions were perfect, a cloudless sky, no wind, and a tide that just started rising along with the sun. It was the complete opposite of the morning we had just one month earlier. Our first trip together happened just after a nasty March cold front with twenty knot winds that churned up the flats and made sight casting almost impossible. I fought a constant battle just to keep control of the skiff but Don still managed to land a nice legal-sized redfish on fly early that morning. Sally followed up with one of her own on spinning gear just before lunch. They were the first new clients I’d fished with in some time and we were off to a lucky start. They were also that perfect combination of good anglers who were easy to deal with on a tough day, so I was more than happy when Don started talking about booking a tarpon trip with me in early April. Over the next three weeks I fielded lots of phone calls and e-mails from Don about flies, fly lines, leaders, and hook sizes. Believe it or not, I actually like getting calls at dinnertime from my clients asking me questions like “I’m tying some Tarpon Toads, should I use rabbit fur or marabou for the tails?” I take that as a sign of a serious angler, and Don was definitely serious. That’s why I found his tardiness that morning kind of puzzling. But he and Sally were willing to come all the up from Estero to fish with me again so I let it slide when they finally rolled into the parking lot. It was a few minutes before 8AM when we motored away from the dock and there was still plenty of morning left for us. Matlacha Pass was flat calm and the run up to Charlotte Harbor went quickly. The water was gin clear and 76 degrees, perfect conditions to find some big tarpon. We rounded the north tip of Pine Island and I aimed my Beavertail skiff west and pressed on until the shoreline of Gasparilla came into view. A few minutes later we were approaching the shallows of my favorite tarpon spot. Just as I was pulling back the throttle I noticed the other boat coming from the west and aiming for the same sand bar. He came off plane first and idled right up to the edge of the flat. There was a lone angler running the boat, which was a very expensive looking Hell’s Bay, and he immediately jumped up to the bow with a fly rod and started his trolling motor. Now I was annoyed. Someone had beaten me to my spot by less than a minute and was in position to get the first shots at every fish running down the flat. If Don and Sally had been on time we would have been well in front of this guy. I grumbled a bit but there was nothing to be done about it. I decided to just drop my Power Pole and let the other skiff move down the flat, silently praying that I wouldn’t witness him hook a tarpon right in front of us. I had Don step on the bow and make some practice casts until the Hell’s Bay was far enough away from me. After several minutes I lifted the anchor and started poling across the three foot deep sand. I kept an eye on the other boat and just a few minutes later the angler stepped off the deck and slowly motored off the flat without making a single cast. Now we had the stretch of water to ourselves but I was worried that the other angler left because there were no tarpon. It was just after 9AM and the sun was hitting the water at a perfect angle. I could see everything within 200 yards of us and a big tarpon would be really obvious. I could also see the top of the Boca Grande lighthouse straight to my west. There would be hundreds, maybe thousands of tarpon pouring through the famous pass that morning. 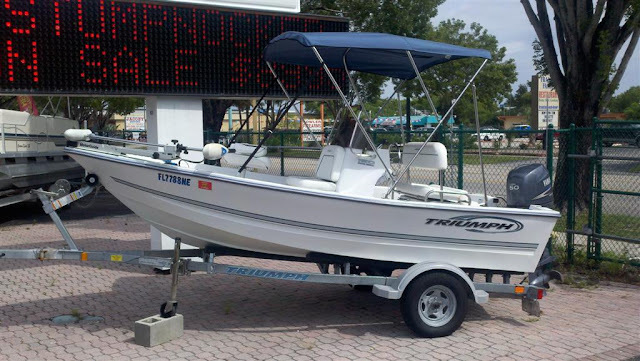 There would also be dozens of big center console boats drifting and motoring through the mile wide cut slinging live bait and heavy jigs at the mass of fish rolling in the deep water off Gasparilla. Boca Grande Pass was only a few minutes away but it was the far side of the moon as far as I was concerned. The full contact style of fishing they do out there is the polar opposite of the way I chase tarpon. I would rather get a single jump from one on a fly rod than muscle in a dozen fish using big conventional reels. But the way the flat seemed this morning, getting Don that one jump was looking doubtful. I quietly cursed at myself over the next few minutes for not insisting we leave a half hour earlier, convinced we already missed our short window at any fish. Tarpon are often a sunrise deal on the flats and it was now almost 9:30. That’s when I saw the black spot in the water quickly moving towards us. I spun the boat with the push pole as fast as I could to give Don a downwind shot. The fish sensed the sudden motion and made a quick left turn off the bright sand and into the darker grass, giving Don a lousy angle but I had him Hail Mary a cast straight off the bow to where I thought the tarpon might be heading. The purple fly was invisible once it hit the dark water and our one shot looked finished. I was just about to have Don try one more throw when the slack line from his rod tip twanged tight like the arresting cable on an aircraft carrier. We never saw the fish eat the fly but we all witnessed the aftermath. Six feet and well over one hundred pounds of brilliant silver tarpon came rocketing through the surface just twenty feet from my bow. The huge fish seemed to freeze for a moment in the air, completely out of the water and in that perfect mouth open, gills flared pose that every taxidermist loves to replicate. From the poling platform I had a fantastic view of the sparkling tarpon and several bucket’s full of spray flying through the air, with Don just below me locked on to his heavily bowed fly rod. It’s a sight I’ve witnessed countless times and still never get to see enough. The tarpon smashed back into the water a heartbeat later and it was all done. Without seeing the fish eat, Don never had a chance to set the hook with the necessary violence that tarpon require from a fly rod. Sally was poised between us with the camera ready to capture a second jump that wasn’t going to happen. The fish disappeared as quickly as it arrived. It was one of the largest I’d ever seen off Pine Island. It was also our only hookup of the day. We moved on to other flats and cast to a dozen other fish but none would play the game. I wasn’t too disappointed. 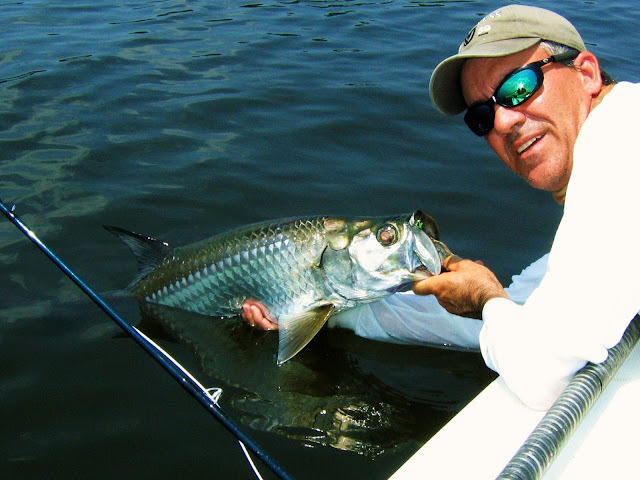 It was early April and tarpon season was just beginning. This time of year I often hook these fish through a combination of blind luck and just being in the right place at the right time. I thought about that as we ran home around lunchtime. We were definitely in the right place that morning. And we were there at the right time all because Don and Sally were fifteen minutes late. Right now we're at the height of the annual tarpon migration. I've been spending almost all of my mornings in six to ten feet of water between North Captiva and Gasparilla looking for the big schools of fish that are heading up from the Keys. There are thousands of tarpon pouring through the Gulf and the Passes separating the barrier islands. Getting them to eat this week wasn't easy thanks to the really bright full moon but my anglers have been feeding at least one or two of them live crabs every day. These are some huge tarpon and they'll keep pouring through for at least another couple of weeks. After that the juveniles will be here well into the fall. Hot as hell out there on the water but this is still my favorite time of year. This is a really clean little skiff being sold by a friend down in Bonita Beach. Click here to see the full listing. My brother and his family are in town and we've been having a blast on the water these last few days. Tarpon season is in full swing here in Southwest Florida and these shots were taken yesterday in upper Pine Island Sound. There were several schools of huge fish rolling at the surface in about 12 feet of water and we watched a couple of live bait boats put fish into the air. 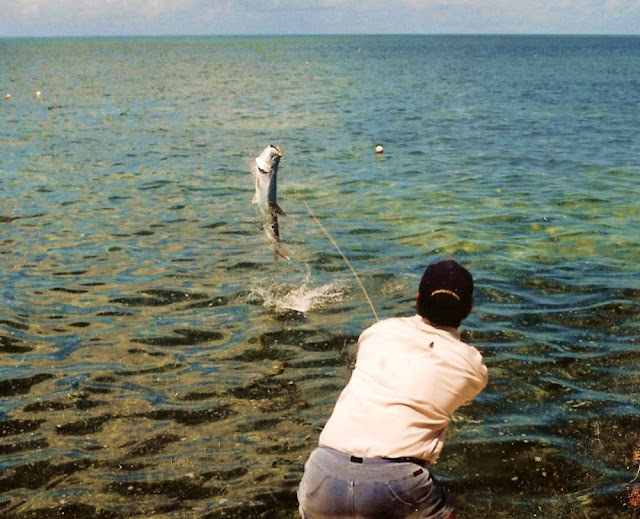 I had a fly fishing charter so we spend most of our time in the shallower water off Cayo Costa. There was an excellent flow of tarpon cruising up and down the beach and for two hours we had steady shots but no hookups. The fish seemed to be in a big hurry out there and none of the other boats around us stuck any on fly either. The water was still a bit murky thanks to last week's tropical storm so give it a few more days and conditions will be really excellent. Something remarkable happened out on the water today. I was poling Wyoming anglers Ann and Al Maki in the north part of Matlacha Pass around just after 9AM when I felt a sudden warm sensation hit the back of my neck. I spun around to see what caused it and was stunned to see a huge yellow orb in the sky burning through the clouds. I stared at it in disbelief for several seconds until it actually began hurting my eyes and I was forced to avert them quickly. What was this impossibly bright object spreading heat and light across the waters? Was it some kind of god, angry at me for daring to look in its direction? Should I bow down in fear before it to save myself from certain incineration? All of these thoughts ran through my head until my anglers informed me that the bright, burning sky-orb was something called "The Sun." The Sun! Of course that's what it was. This is Florida and it's up there almost all the time. Boy, did I feel stupid. I just haven't seen it in six whole days thanks to a weather system that became Tropical Storm Andrea. But the sun came back today and so did the redfish. Ann managed to land a nice pair as well as a handful of trout on both Gulps and live shrimp. Al kicked in a small snook just before noon to complete the Slam and it turned out to be a great day. Welcome back, sunlight. We've missed you. Hurricane Season didn't waste any time getting started and Tropical Storm Andrea passed over us on Pine Island this afternoon. The winds and rain that came before it didn't stop us from fishing all week and we even managed some decent catches. One of my long time anglers Theo Chupein from NJ was here for several days and managed to land another Grand Slam this year. His tarpon was on the small side but it was his first on fly so it counts even more. We had a great trout bite this morning despite all the rain and stayed on the water until the serious storm bands started moving through around noon. Andrea made landfall north of Cedar Key late in the afternoon and we actually had a nice sunset here on the island. The weekend is looking sort of decent and this tides are great for the next few days. I don't think this storm will cause us to miss too much out there. A cool video of my buddy Capt. 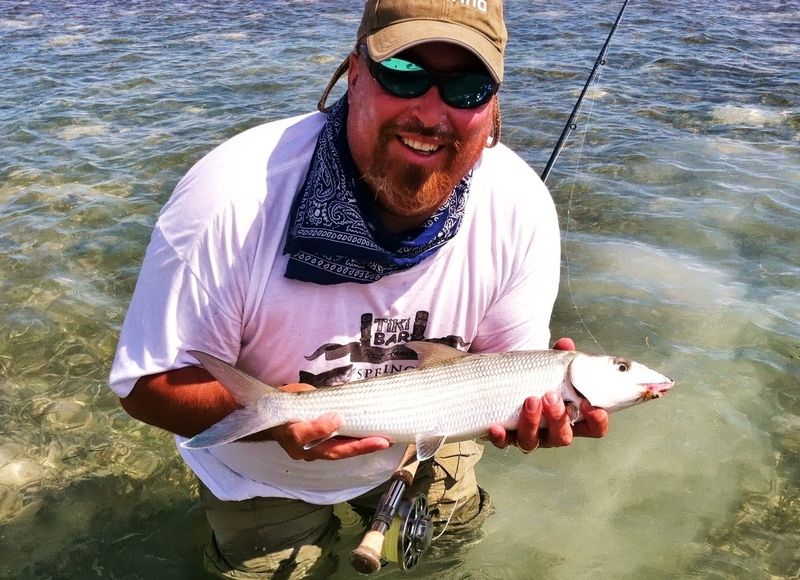 Mike Bartlett on the flats of Key West. Tarpon Fishing Florida Keys HD from Morgan Lewis on Vimeo. Yesterday was the last morning we'll probably see the sun for a few days. Hope you all enjoyed it if you were out on the water off Pine Island. We've got lots of rain heading our way thanks to a tropical system that just came across the Yucatan. The good news is that plenty of tarpon are out there and willing to eat. Rainy mornings can actually be rather calm and as long as there's no lightning in the air it's possible to go out and catch a few. It won't be as enjoyable as it was in the above photo. Goodbye Sunshine, I'll miss you.